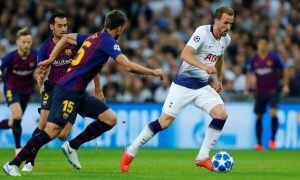 'Better than a new signing' - Every Tottenham fan is over the moon with club announcement | The Transfer Tavern | Where football transfer rumours fly or die! The on-going heatwave in the UK hasn’t helped some anxious Spurs fans who have been waiting for new signings, however, they’re now being treated to five more years of the right sort of Son. Tottenham’s Korean winger has agreed on a five-year contract keeping at the club until 2023, fans can read more on Spurs’ website as they celebrate their superb Asian stars extension. Heung-Min Son is one of the most underrated players in the Premier League. The industrious winger never fails to track-back and help out his full-back and he often clocks up more ground covered than any other player on the pitch. His game isn’t all about hard work, though, as his ability to score goals with both feet from out wide and through the middle make him one of the most dangerous forwards in the league. Unfortunately, the Korean livewire will miss the start of the premier league season as he’s competing in the Asian Games for South Korea in a bid to gain exemption from two-years of military service. However, when the 26-year-old returns there’s no doubting he’ll go back to tormenting defences and taking some of the goalscoring burden off of Harry Kane, as he has done for the last three years since he joined the club from Bayer Leverkusen. BETTER THAN NEW SIGNING LADS! The excitement surrounding Son’s new contract is massive and the Tottenham fans are delighted that their man will continue to tear opposition full-backs apart for years to come.